If you’re anything like this A.V. Club staff writer, then you’ve probably spent the last four days listening to Kendrick Lamar’s new album Damn., developing over-elaborated opinions on the literary merits of “Duckworth.” Now comes the first video to drop since the album’s release, and whether it’s your first taste or your latest fix, it’s a treat. 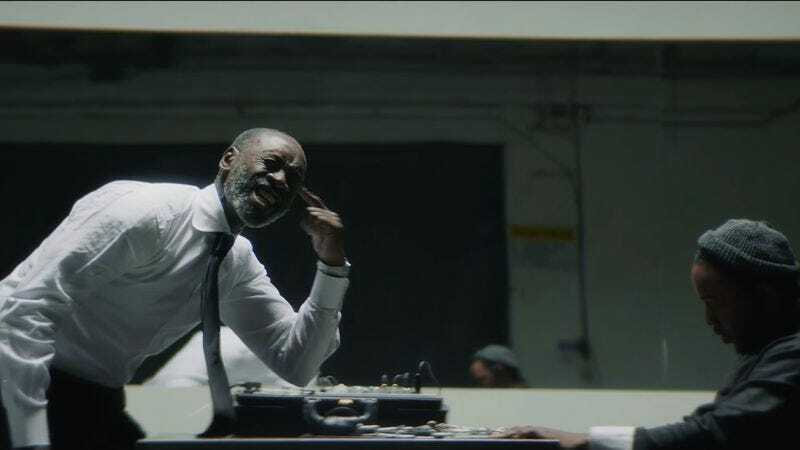 Co-directed by Nabil Elderkin, Kendrick, and Kendrick’s manager, Dave Free, “DNA.” finds the Compton rapper being questioned by (and eventually possessing) a suited investigator played by Don Cheadle. The voice and words in the ensuing interrogation room lip-sync-off might be Kendrick’s, but the winner is clearly the graying Cheadle. There’s more to the video—including an alternate track outro, a Schoolboy Q cameo, and Kendrick Wu-Tang-ing it up in a changshan—but we’re mostly struck by the idea of Cheadle as an unwitting rap medium, spitting rhymes instead of ectoplasm. (One can almost imagine an entire Donald Kaufman-esque backstory for his personal vendetta against rap music, but it’s like he’s fighting himself.) You can watch ”DNA.” below.